Coffee With A Cop: A Great Stop! Posted on October 3, 2018 | Comments Off on Coffee With A Cop: A Great Stop! There was a heavy police presence this morning at Aux Delices. Westport Police celebrated Coffee With a Cop day, at the popular downtown spot. 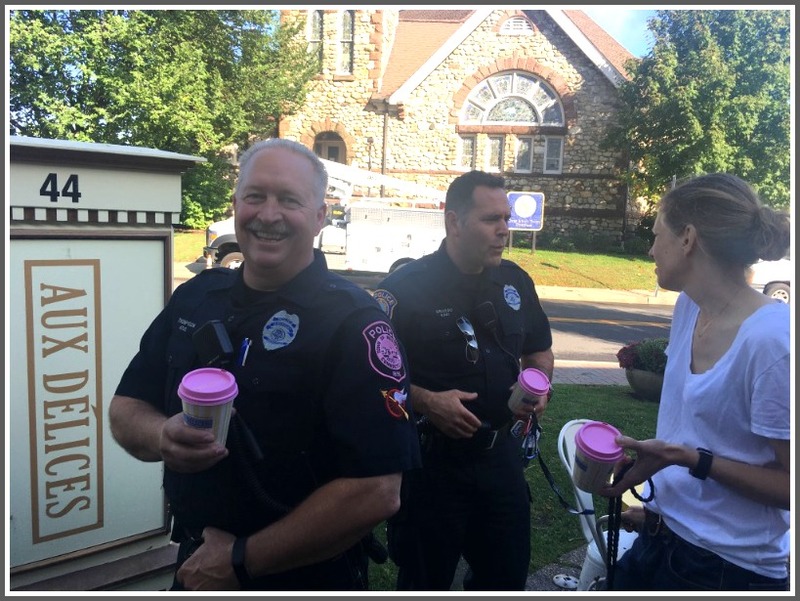 Alert — and caffeinated — “06880” reader Jo Shields sends this photo of Officer Scott Thompson (sporting the WPD’s special pink breast cancer awareness patch), Office Mark Grasso and Westporter Ligia Brickus. Officer Thompson commented how nice it was to meet everyone who stopped by. I thought it was great to have a stop for coffee — not a traffic stop! We are so lucky to have such caring and competent members of our police force. Conversations included officer commutes (Fairfield is lots easier than Milford! ); raising 3-year old boys; little old ladies and kids being more comfortable approaching cops when they’ve got their motorcycles; finding time to sew the patches; the NY, PA, DC 9/11 Ride, and who gets to drive that pink Maserati this month! In addition to the pink shoulder patches, Aux Delices provided pink-topped coffee cups, also for Breast Cancer Awareness Month. It was a fun event, with lots of smiles all around. This entry was posted in Downtown, People, Police, Restaurants and tagged "Coffee With a Cop", Westport Police Department. Bookmark the permalink.